Congratulations to Spencer Nordquist. 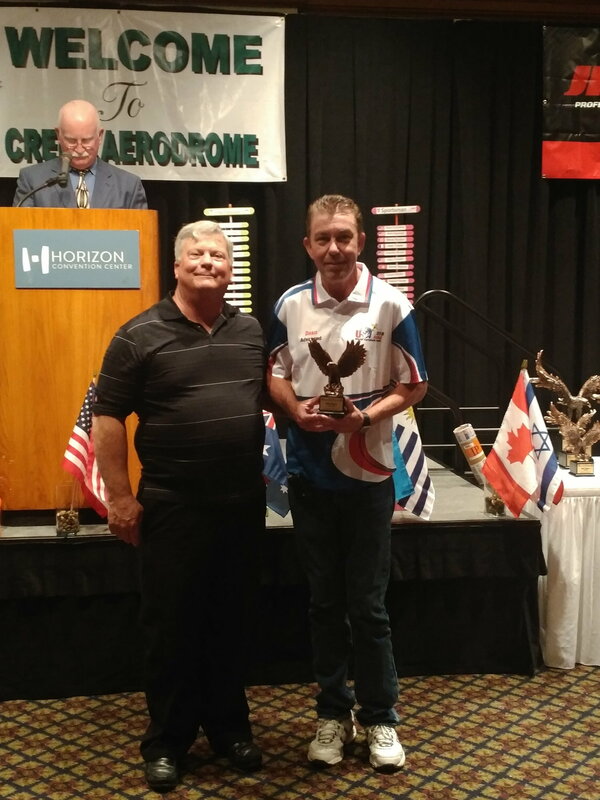 He won our WC Qualifier in the Unlimited class flying his Romanian Scheme and will represent Team USA at next year's IMAC World Championships. Cayden Bruce will be on Team USA in the Sportsman class. He earned his spot on the team by winning 3rd place at the IMAC Nats flying his Yellow Chequer Scheme. What a beautiful flying day today. The Weather Channel app calls it "Abundant sunshine" with 76 degrees and calm winds. Here's Cayden Bruce in a t-shirt taking his Yellow Chequer Scheme out for a practice flight getting ready for the Intermediate class. Rusty Fried brought a crock pot of chili with all the toppings. Kirt Campbell brought the leftover honey ham and Hawaiian rolls for some great sliders. Last edited by Dean Bird; 02-21-2018 at 03:13 PM. Wow!! 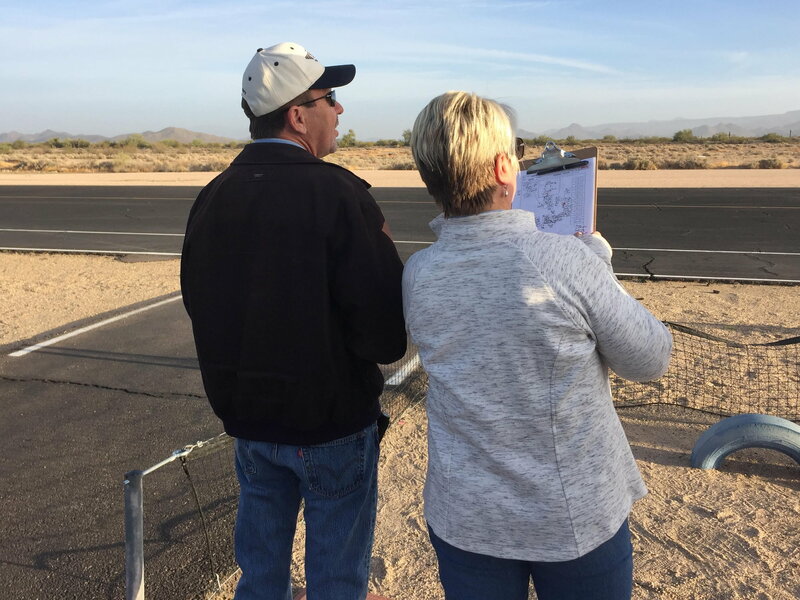 After an email in August I had gone from no plans to fly this fall to flying three events in a six-week span, winning at the Tucson Aerobatic Shootout, and qualifying for the IMAC World Championships. Needless to say, this has made a big change to next year's plans. I moved up to Unlimited to try and gain flying skills in preparation for the IMAC World Championships in September. I had 15 practice flights for a total of 30 sequences before the Supersition Challenge last weekend. On practice flight 15 I had finally gotten through both sequences in a flight with no zeroes. I was ready. We had an absolute blast at the contest with abundant sunshine, temps in the mid to high 70s, and calm winds all weekend. Couldn't ask for more. We had six pilots in our Unlimited class. I had lots of friends judging and calling my flights so we were making jokes and cracking up at the bad stuff. Over-rotate the 1 1/4 snap to knife edge and only have 30 degrees left to fit in a 2 of 8... "Nice 2 of 32!!" We were celebrating any success. Hit a double positive snap on the downline... "Boom!!" I ended up 2nd place... in the competition for 2nd to last place. I did get several scores of 10... on Sound. It is interesting to see the total "percentage of perfection" on your Final Score. I averaged a score of 6.76 per maneuver. Bryant Mack averaged 8.89 per maneuver for the contest and 9.25 in the Unknown round. I am not now, or will ever be, competitive in the Unlimited class. For sure I am gaining skills to compete in the Advanced class at the World Championships, though. I hope to see everyone at the Winter Roundup at Felix Ranch on February 17th for some more entertaining flights, hooting, hollering, and good times. Last edited by Dean Bird; 01-18-2018 at 03:19 PM. We had great weather and great competition last weekend at the Winter Roundup at Felix Ranch. Temps in the low 70s and calm winds both days. It was also an Alternate Sequence contest. That was a LOT more fun not dealing with a rolling circle seven times on the weekend. Without the rollers my average score per maneuver increased from 6.76 to 7.64. I finished 1st place... in the competition for 2nd to last place. The contest report said, "The tightest competition was for 3rd place in the Unlimited class, with only 12.159 points difference between Alex Dreiling and Dean Bird." Close competition with friends is what makes IMAC fun. It was a great weekend!! My third contest in the Unlimited class was last weekend at the Tucson IMAC. I hadn't done a roller in almost 2 months so I spent one flight on Friday trying to get safe flying it again. We had 7 pilots in the class. In my afternoon round on Saturday I got the inputs crossed up during the outside portion of the roller and started turning the other way. I had to bail out, bring the plane back to show center, and resume the sequence. I've been told rollers are your friend. Not mine yet. At the end of the day Saturday I was having a great competition for 2nd to last place with a pilot that was borrowing a plane he had never flown. I was leading by 4 points. On Sunday morning I was totally overwhelmed by the Unknown. Lots of snaps starting and stopping in all kinds of odd places. I ended up 2nd place... in the competition for 2nd to last place. This was my second contest including the Unlimited rollers. My percentage of perfection increased from 6.76 my first contest to 7.08 for this contest. A positive trend. Cayden Bruce won the Intermediate class with his Yellow Chequer Scheme Extra 330SC. Congratulations Cayden!! Craig Guest won the four Known Rounds in the Advanced class on Saturday flying his CARF Scheme Blue-White Extra 330SC. He had to withdraw due to an engine problem and didn't get to fly the Unknown. Craig, sorry about your troubles. I hope you get that engine straightened out. Last weekend was the 2018 Cactus Classic. It's a contest with decades of history. Last year's class winners are awarded their Cactus Classic jacket at the contest. I was the winner for the Advanced class last year and received my CC jacket. The Advanced class seems like a lifetime ago. This was a VERY special contest for me. My wife, Nicola, has agreed to be my caller for the World Championships in September. The final day of competition is her birthday. I know she could think of many other vacation spots for her birthday, but she is going to be in Muncie, Indiana, calling for me. This was her first contest to give it a shot. She knew nothing about Aresti and had never even scribed at a contest. She was jumping right into the deep ending attempting to call for an Unlimited sequence. 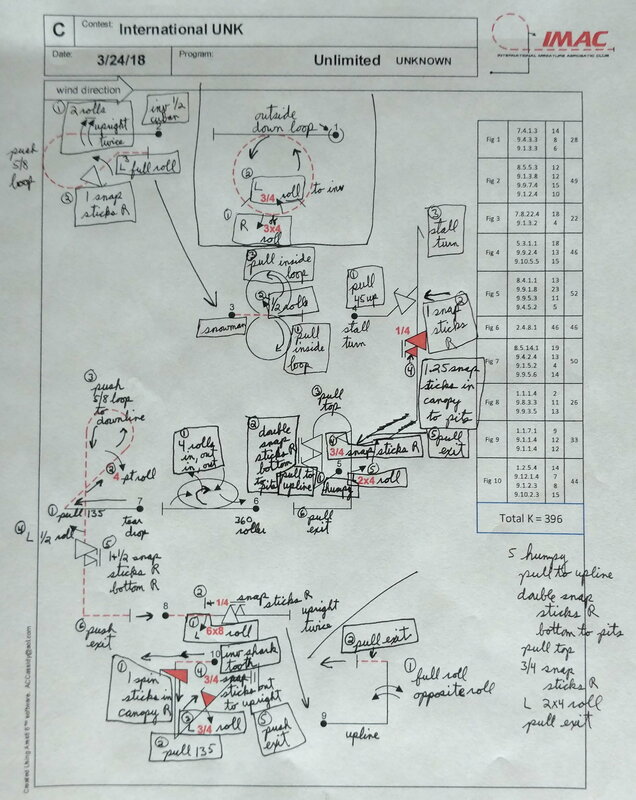 We did a crash course on Aresti and she made "a few" notes on the Known Aresti. Notice her legend in the lower right corner. It was a Known so I called it during the first flight so she could watch and hear the timing compared to the plane's spot in the sequence. She took over on the second flight. She did great. She was ready for the Unknown. 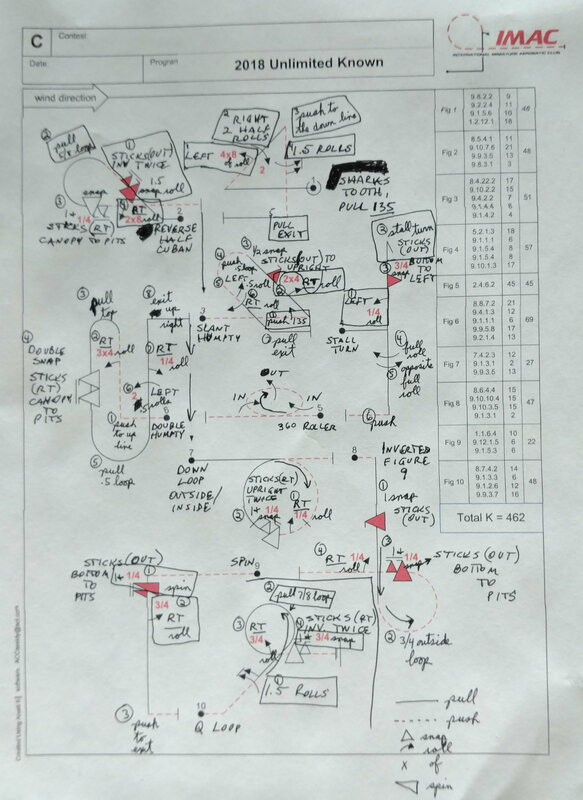 On Saturday evening she walked me through it telling me what the maneuvers and elements were and asking me what to call. She made "a few" notes and we ran through it twice on Saturday evening. I arrived early on Sunday morning to put the plane together. I had to get a clean Aresti for the Unknown so I could run through it before she arrived. I couldn't actually see the Aresti on her call sheet. We flew the Unknown and she was incredible. So calm, so relaxed, and a smooth delivery. It was the coolest flight ever for me. There's a saying that it's all the caller. I've been competing hard for 2nd to last place this year. Ignoring the 11th place pilot since he didn't fly Sunday, I finished in 3rd to last place out of 10 pilots. My best finish this year. I let her know it was all because of her awesome calling. Thank you Nicola!! Last edited by Dean Bird; 03-29-2018 at 04:18 AM. My fifth contest in the Unlimited class this year happened last weekend in Hemet, California. We only had a 3 pilot class. The total count didn't matter. It was still me and one other pilot in a fierce competition for 2nd to last place. 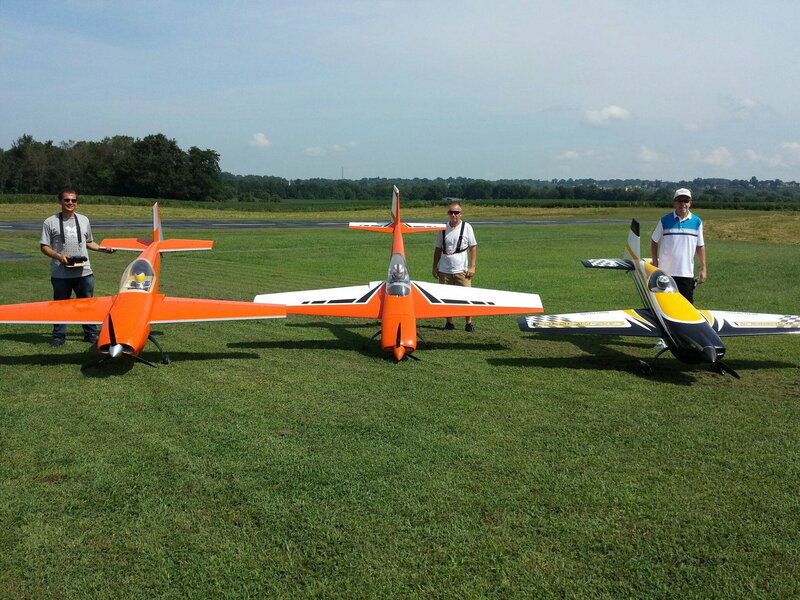 I flew two of the best Knowns I could on Saturday. I had a slight lead for 2nd to last place. I could tell by the scoring that I still had the superior hardware. We had a very windy round on Saturday afternoon. My plane handled the "contest" conditions easily and my scores weren't impacted. I was still scoring an average around 7.5 per maneuver. Both the other pilots had planes that didn't handle the conditions as well and their scores showed it. This plane is fun to fly. I was happy to see our Unknown for Sunday morning. 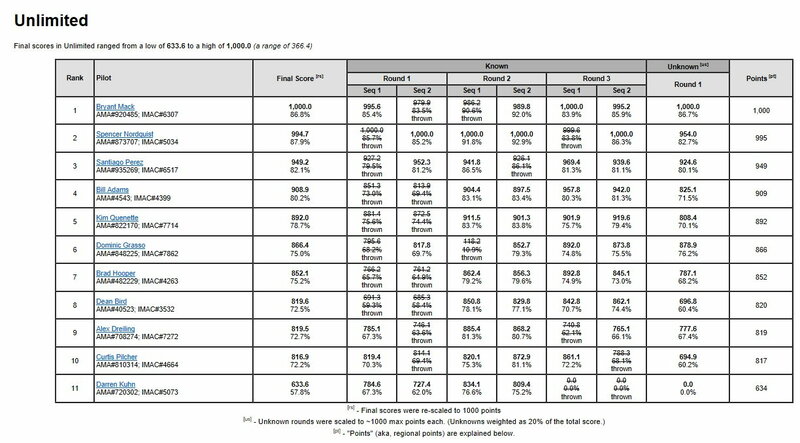 It looked like a slightly tougher than usual Advanced Unknown that we might see at the World Championships in September. This would be good test to see if all this Unlimited flying had added new skills to prepare for the Worlds. I flopped. I overcooked the 1 1/4 snap on the downline on one maneuver and overcooked the single positive snap going into the Split-S. Two zeroes. Ugh. Once again I finished in 2nd place... in the competition for 2nd to last place. 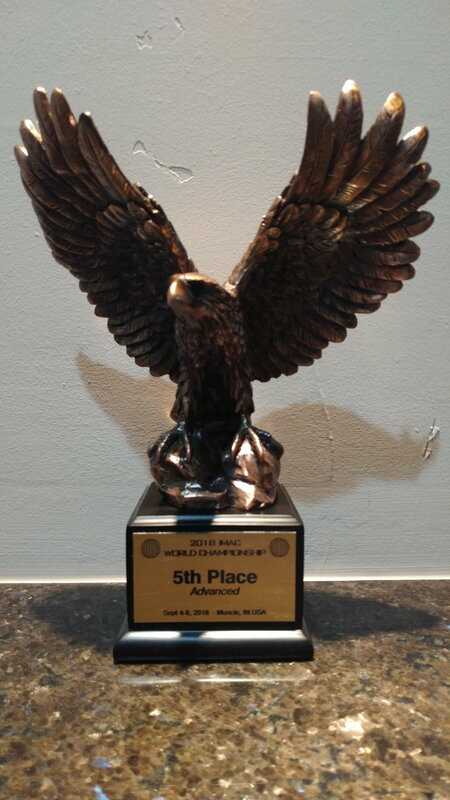 I was given the 3rd place trophy for participation. Flying in the Advanced Class feels like a lifetime ago. My confidence as a pilot has never been lower. That doesn't really matter. We're having fun at the contests. I will fly the World Championships to enjoy the experience and camaraderie with pilots from around the world. Everyone have a fun summer!! I finally got the plane back out on the weekend of August 4th to practice for the Advanced class at the IMAC World Championships to be held September 5th - 8th. We had one weekend with the flying field closed due to rain. I'm not used to losing practice time in Arizona due to rain. I took time off work to practice a few extra days before hitting to road to Muncie, Indiana. On the 2nd to last day of practice before leaving I had an unexpected dead stick. I managed to get it back to the runway safely. Yikes!! I took off the hatch to check the fuel level. The rear zip tie on the fuel tank tray had let go. Over five years in the desert has made the zip ties very dry and brittle. 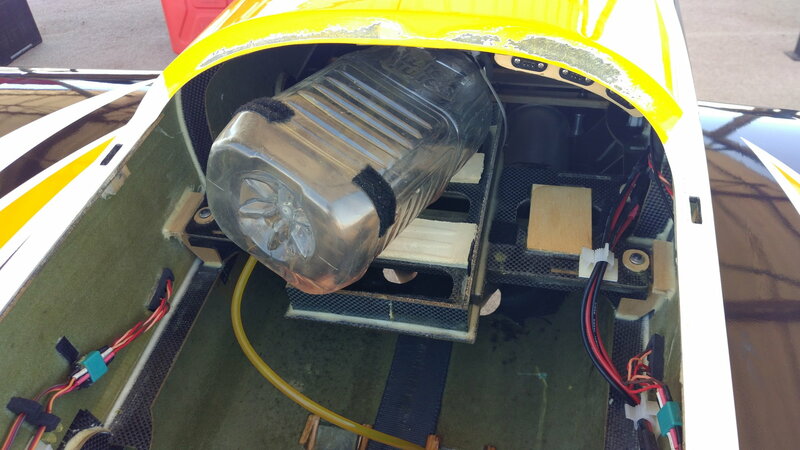 I noticed a little damage to the instrument panel from the tank moving up on that edge of the tray. It looked like all the fuel lines were still secure. Then I noticed the zip tie had caught the exposed foam edge of the air exit hole on the way out. Aaargh. 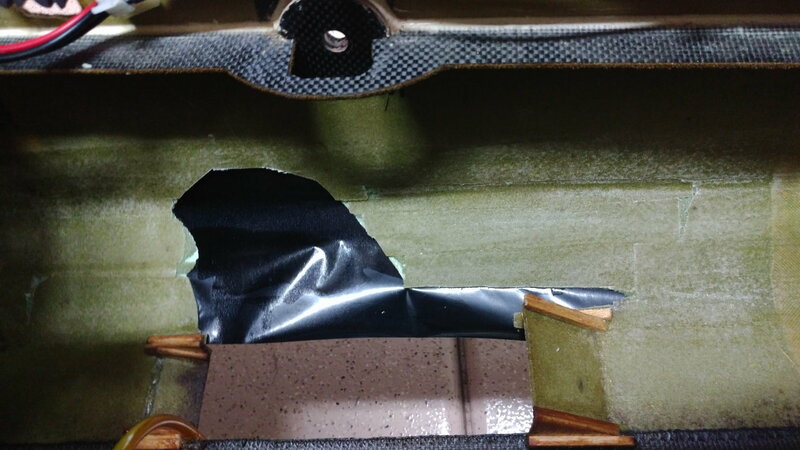 That small area got out in the airstream and took some bigger pieces of color with it and there were cracks on both sides of the damage.In hindsight I can see it would have been a good idea to put a layer of light carbon cloth on that exposed foam edge to give it strength. I was supposed to practice for one more day and then hit the road. I wasn't sure what to do. I sent a text to Alex Dreiling, our IMAC Southwest Region Director. He said to bring it over and we'll fix it. Awesome!! Here's a picture of the damage from the outside. 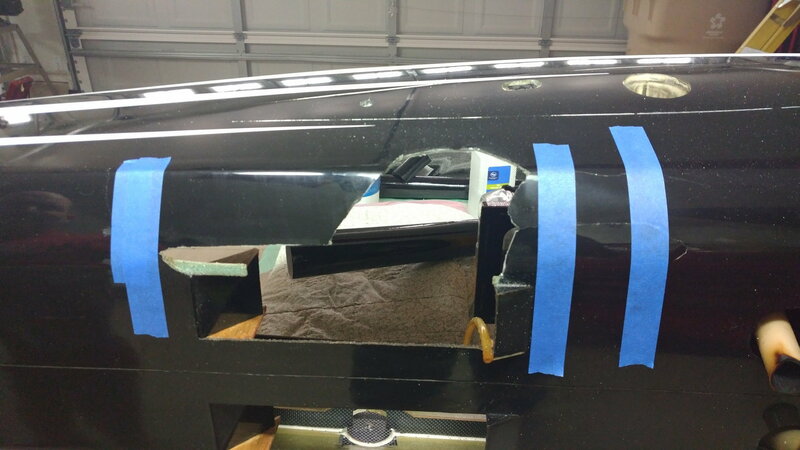 Alex started by removing the exposed foam where the color coat had been ripped off and taped across all the cracks. Then he ironed some Econokote on the outside of the plane at low temperature. Then Alex moistened one side of a sheet of 1/64" ply and we taped that on top of the Econokote. This was intended to provide the shape of the outside of the fuselage. 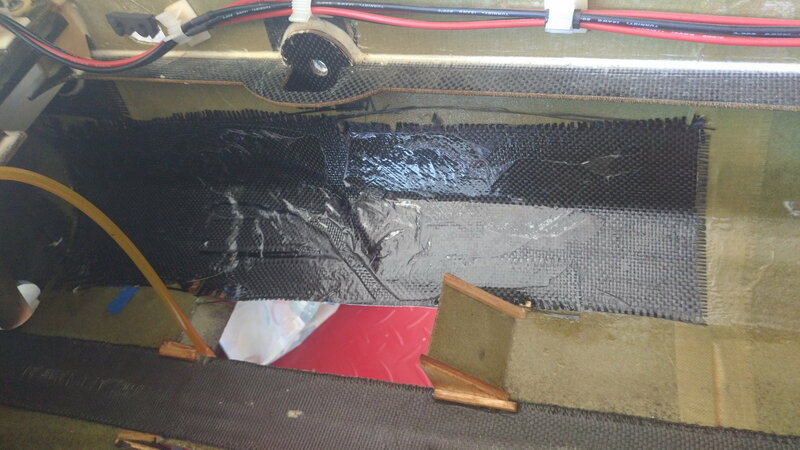 Other than moral support my one contribution to the repair was sanding the gloss off the inside of the fuselage where we would be putting in the carbon cloth. 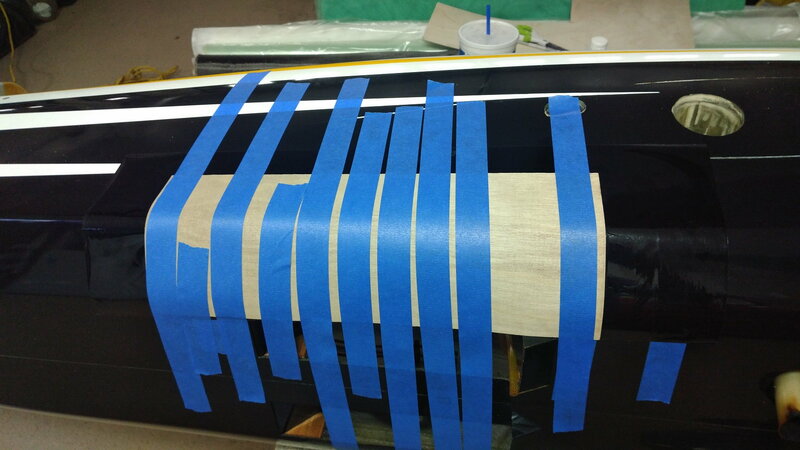 Alex started with a layer of West Systems epoxy on the fuselage. I had cut an appropriate size piece of carbon fiber cloth. Alex layed it into the epoxy and then put a coat of epoxy over the top of the cloth. 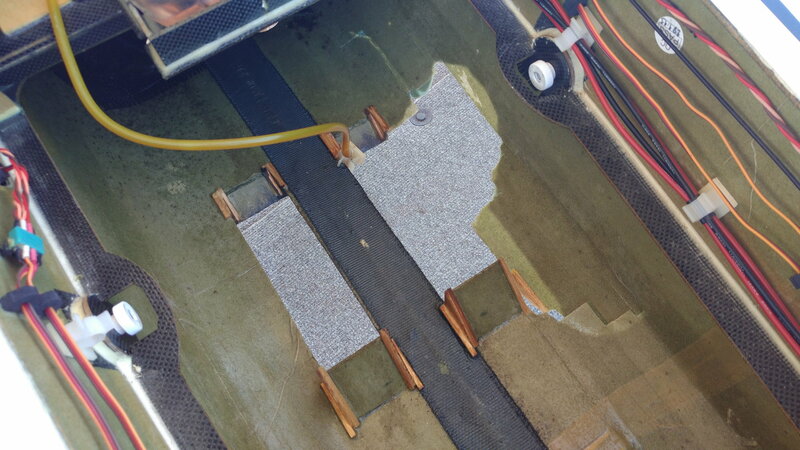 He had some sort of clear film that he put on top of the cloth and epoxy and used that to press all over the carbon cloth to integrate the epoxy and get the cloth pressed to the fuselage. 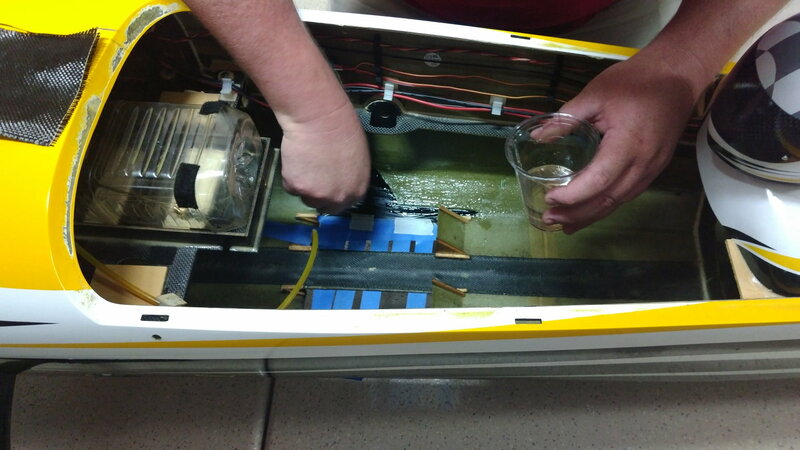 Alex said the epoxy needed 24 - 48 hours to cure. I decided to hit the road a day early and pick up the practice day after getting to Hebron, Kentucky, where I was going to practice until the AMA site was available. After the drive I removed the plastic film. The repair was rock solid. I pulled the tape, plywood, and as much Econokote off as a I could. 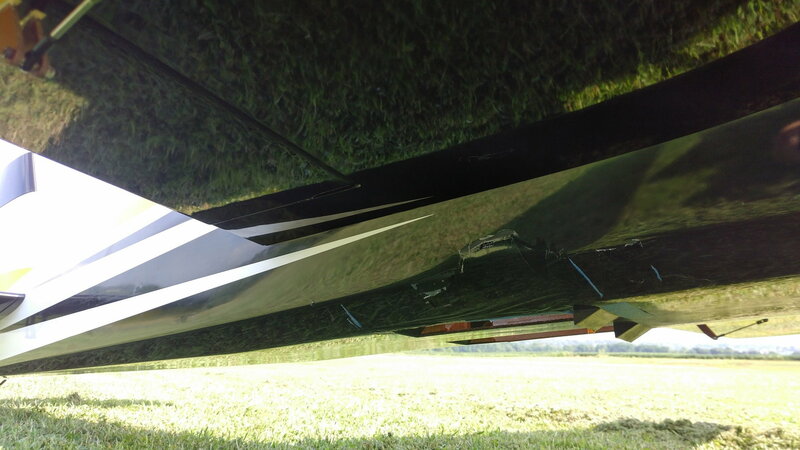 The repair is under the wing and is never noticed. My sincere gratitude and huge "THANKS" to Alex Dreiling for quickly handling this repair and allowing me to participate in the IMAC World Championships!! I arrived safely and spent three days practicing in Hebron, Kentucky, at the home field of Ray Morton. Ray was the Team Manager for Team USA. I had a great time the first two days hanging out with a couple of the club members and Ray and practicing with the two members of Team UK (Thomas David and Dave Staley). My wife, Nicola, was my caller for the Worlds. I picked her up at the airport and she practiced calling Unknowns for the last day in Kentucky and for two days in Muncie. We were ready. Big "THANKS" to Ray and his club for hosting us before the competition. As with every contest my two primary goals are to bring the plane home in one piece and to have fun. In this case I actually had two competitive goals. I wanted to finish in the top half and I wanted to take a round from these kids (it's awesome to see so many kids flying at this level). On Day One I flew the cleanest Known I had flown since I started flying it a month before. I won that round so I could check off that goal. I flew a solid Unknown the afternoon of Day One. Nicola did an awesome job calling for me. I finished in 3rd place out of 15 pilots at the end of Day One. Lots of work to be done to still finish in the top half to meet my other competitive goal. Day Two started with the Unknown. Nicola did another awesome job on the call and I scored better than Day One. I moved up to 2nd place after the Unknown on Day Two. At this point the wheels fell off. For ten seasons of IMAC competition in the Basic through Advanced classes I don't remember ever having a Known sequence score in the 800s. I flew three of the worst Knowns I have ever flown. I scored in the 800s for the first two Knowns. In the third Known I was putting in wrong rudder inputs and almost crashed once. I have no idea what happened in these three flights. Three of my worst flights ever dropped me from 2nd place to 5th place. At that point I was hoping we could get Days Three and Four in to try and redeem myself and move back up. Both days were rained out. I met my goal of finishing in the top half. 5th place was in the top third. I was really disappointed to fly three of the worst sequences ever and have them all on one day at the World Championships right before the second half of the contest was rained out. After watching rain on the radar for two days it was great to have the Awards Banquet. It was cool seeing all the countries at the contest. I really enjoy these big events where I get to catch up with long time friends. I was still disappointed with my Day Two performance but proud to receive the 5th place trophy from IMAC President and Contest Director, Mike Karnes. My two primary goals (plane in one piece, have fun) were also met. The plane is back home safely after getting over 4,000 road miles in my Tahoe. I had a great time seeing long time friends, making new friends, and everyone loved meeting my beautiful wife, Nicola. I'm really glad I took the opportunity to fly at the IMAC World Championships. Congratulations to all the pilots on a great contest. A special shout out to my fellow IMAC Southwest Region pilots Cayden Bruce and AJ Jaffe. Cayden is now the Sportsman World Champion and AJ is now the Intermediate World Champion. Great job guys!! 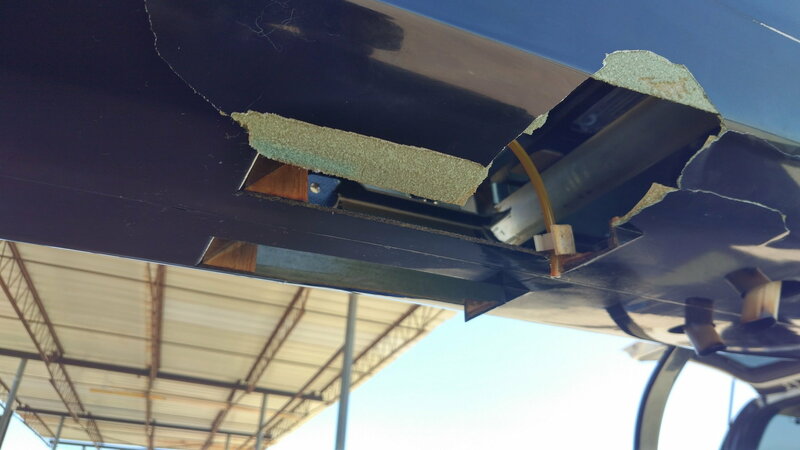 My personal "Thanks" to Alex Dreiling for the airframe repair that got me to the contest and to all the Event Team volunteers that spent the last two years preparing and executing this amazing event. There is no way to express how much all the pilots appreciate having the opportunity your work has provided.